Using the SALD-MS23 sampler, the measurement range is 17nm to 2500μm for wet measurement. 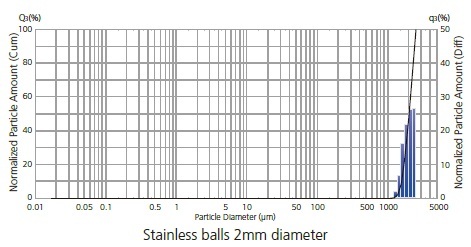 For example, PSL particles with a median diameter of 50nm and stainless balls with a diameter of 2mm can be measured by a single analyzer. Various sample amounts (Suspension) can be selected according to measurement objects and purposes. 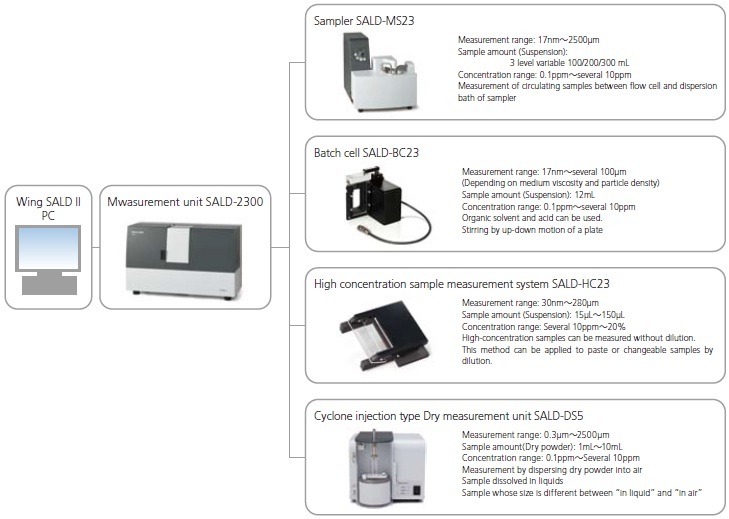 Sample amount for SALD-MS23 is variable: 100mL, 200mL, or 300mL. Sample amount for batch cell SALD-BC23 is 12mL. In the case of high-concentration sample measurement system SALD-HC23, optional indentation can be used for sample amounts ranging from 15μL to 150μL. 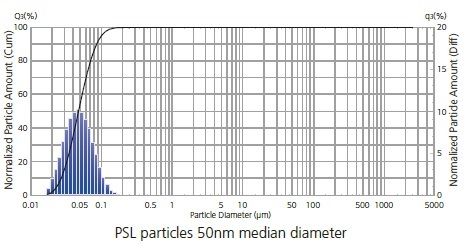 By enabling measurement under wide particle concentration conditions (0.1ppm to 20%), changes in particle size distribution depending on particle concentration can be evaluated. Previously, the particle concentration of a sample had to be adjusted to meet the optimum conditions of analyzers by dilution or concentration using a centrifuge. In these cases, changes in particle size distribution, such as agglomerations or dispersions, could not be considered. Dispersions and agglomeration can be caused by dilutions. In some cases, dilutions can accelerate dispersions, but in other cases, they can create agglomerates. To ensure optimum, the initial particle concentration must be determined without dilutions or concentrations. After the evaluation of particle size distribution at the initial state, the effects of particle concentration from dispersions and agglomerations must be evaluated. Wide particle concentration range must be covered to evaluate the dissolution process of sample particles. This is necessary because the progress of dissolution makes the particle concentration low in comparison to the first particle concentration. SALD-2300 can measure particle size distribution under the conditions of particle concentration from 0.1ppm to 20%. When the sampler SALD-MS23 or batch cell SALD-BC23 is used, measurements are possible under conditions of concentration from 0.1ppm to 100ppm. When the high-concentration sample measurement system SALD-HC23 is used, high-concentration samples up to 20% can be measured because the negative effects of multiple scattering are prevented. In the case of hand cream, dilutions make the particle size distribution narrow. Measurements without dilutions must be done to obtain accurate measurement. The graph to the left shows the result of measuring red wine in the state of the undiluted solution. The low-concentration sample can be measured as an undiluted solution. Measuring it in this state can remove the influence of dispersion or agglomeration by the concentration operation. At left is a graph showing the results of measuring a carbon black particle. The agglomeration particle (micrometer range) has been dispersed to the fine particle (sub-micrometer range) by dispersion processing using a homogenizer. The sample (sample that absorbs light like the carbon black) that doesn't transmit light easily can be measured based on the improvement in sensitivity.